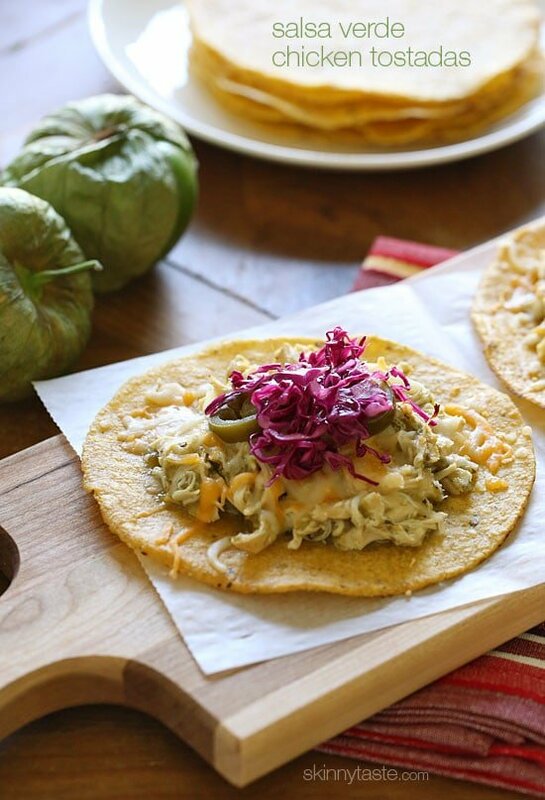 Chicken tenders are slow cooked in the crock pot with salsa verde, then served on a crispy corn tostada and topped with melted cheese, jalapeño and a simple cabbage slaw made with red cabbage, lime juice, cilantro and salt. I could eat these everyday!! 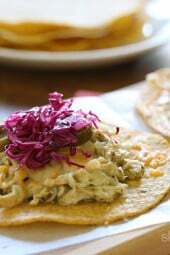 Yesterday I posted the Easiest Crock Pot Salsa Verde Chicken recipe and promised to post the tostadas today. I made these for lunch and everyone in my home loved them (even my husband doesn’t care for cabbage). 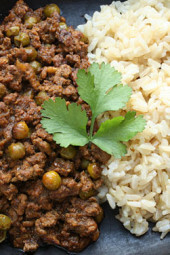 The cabbage adds just the right amount of texture and freshness with a hint of acidity that just works, and he loved it! One was enough to fill me up for lunch, but if you want this for dinner, I would go with two. The crock pot chicken actually makes enough for 9 tostadas, but I only made 6 tostadas for sake of calculating to keep it an even number. It’s really not spicy at all, which is why I added jalapenos. If your family doesn’t like spicy food, leave them out. If you don’t have plans for Cinco De Mayo, I suggest you give these a try!! 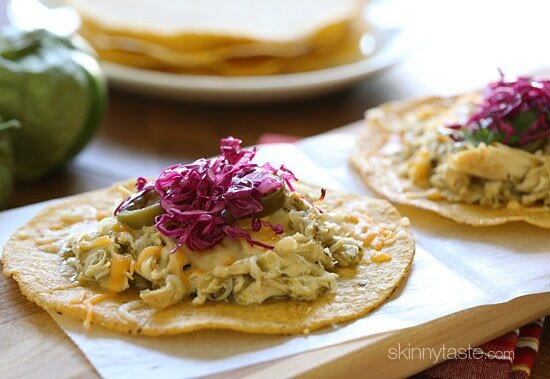 If you can’t find tostada shells, you can follow the same recipe with corn taco shells instead. 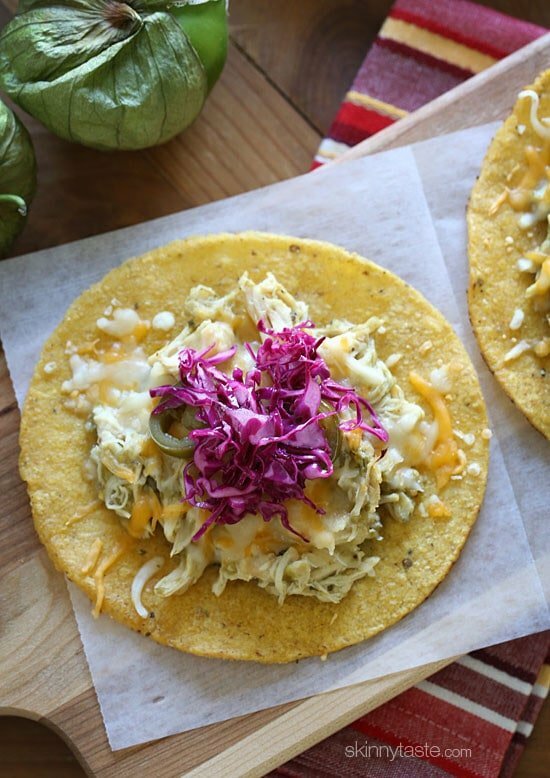 Combine the shredded cabbage with lime juice, cilantro and salt, to taste. Set aside. Place tostada shells on a baking sheet. 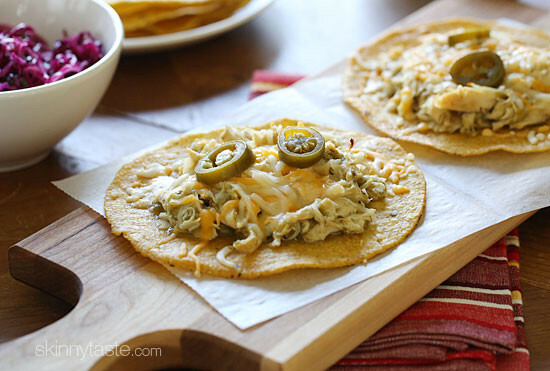 When the oven is hot, layer 1/3 cup of chicken, 2 tbsp shredded cheese and jalapenos over each tostada shell. Bake until the cheese is melted and the shells are crisp, about 4 minutes. Top with shredded cabbage and enjoy! EXCELLENT! Super easy and tasty. Delicious! The cabbage slaw adds the perfect balance of acid with the lush flavor of the chicken. I did add red wine vinegar to the slaw in addition to the lime and cilantro. Love how quick and easy this meal is! So easy and so delicious!! So delish! Made them for dinner tonight. Hubby kept saying yum, yum. I made these tonight and they were SO tasty! Now that chicken is zero points on WW, I had 3 tostadas for only 9 points. (Points came from tortillas, cheese and the little bit of mayo I mixed into the cabbage/cilantro to make a slaw.) Such a filling dinner! This is a winner. Everyone in my house loves it! Really loved this recipe! I used bagged cole slaw mix instead of the red cabbage, added some leftover pickled onions and some avocado – so yummy and satisfying! I know this is an older post but your recipes never seem to fail. This smells amazing and I can’t wait to eat this chicken!! Thanks Gina! Question and Comment: Question: What do you mean be 5 cilantro leaves? Do you mean 5 stems? If I only had the cilantro spice, how much to use? Also, you said that this recipe makes 9 tostadas, but for calculating, you made 6. That would be 1/8 cup of shredded red cabbage mixture on each. My daughter made these for my husband and I and they were delicious! Thanks for sharing! yummmm ive wanted to make this for a long while but could not for the life of me find tostadas in my grocery. today i got adventurous and MADE them!! im so proud of myself. 400 degree oven, put corn tortilla brushed with oil on cookie sheet and bake for 5 min. turn and brush with oil and bake for another 3 min. voila tostada shells!!! deeeeeelish! my whole fam, kids included loved this meal. Love this recipe! Hoping to make it for a bigger group, and wondering if I double the recipe, how much time I would need to increase the cooking time? Gina – Love your recipes! We use almost 2 each week! I have a question for you. My chicken turned out very dry although it was still swimming in salsa. I have the same problem with the crockpot Santa Fe chicken. Any thoughts as to what I’m doing wrong? Thanks! Does anyone know the Smart Points count per serving for this meal? 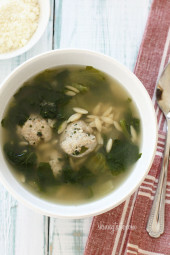 We decided on a whim to make this for supper so instead of a crock pot I used my pressure cooker! I used the exact ingredients for the Salsa Verde Chicken and used partially thawed (sliced into strips) chicken breasts on high in the pressure cooker for 25 minutes! It was perfectly cooked, which we then shredded. We then put it on the tostado shells with the other ingredients and finished them up. So good. If you wet corn tortillas andput them in the microwave for 2 min maybe 230 they turn crispy. Just watch them so they dont burn. I cannot believe how easy and delicious this recipe is! (Added black beans b/c I love them).Hands down my favorite SkinnyTaste recipe so far. Even my picky daughter and particular bf loved it! You make eating healthy doable, and affordable. Thank you so much! We love this! Using cotija cheese takes it over the top. Yum! I'm obsessed with this recipe-made it at least four times in the past month, and it's a hit with my family every time! Instead of the cabbage, I've done shredded lettuce and pickled red onions-a little more kid friendly (my boys are not cabbage fans). This works perfectly with the Southwestern Black Bean Salad, and comes together quickly for busy nights when we have Little League or Cub Scouts. Thank you Gina! Ohhhh holy moly, these were DELICIOUS! 3. Mashed whole pinto beans to soak up some of the delicious verde sauce. I just ate leftovers for lunch and WOW! We'll be making this a LOT. Made this last night with boneless, skinless chicken breast and it was fabulous. Made spanish rice and beans to go along side. 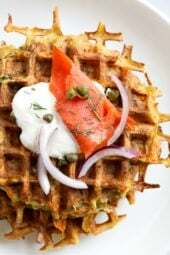 Great recipe and easy to do. I have a question — are the small tortillas already hard? or are they the soft ones? I made these and just love the recipe. I added a can of black beans to the crock pot when the chicken was almost done. I also used the same salsa verde you used which is now a fav.of mine. First time commenting on your web site,regarding a dish. Thanks for making it simple & easy on my time and budget. Thank you for the inspiration Gina! You inspired me to cook with fresh tomatillos for the first time! I gave this recipe a shot in a similar manner but tried the tomatillo salsa from scratch. So yummy!!! Question – I want to try this recipe but I'm afraid it might be too spicy for my kids. How spicy is it?? My daughter really does NOT like spicy food. This was not spicy at all. My daughter ate her whole plate. We used a different brand, but it was still a salsa verde. Some may be marked MILD too. It was very good. Absolutely delicious! Made this for Cinco de Mayo yesterday and it was a huge hit, even with my picky 10 year old! We omitted the cabbage and jalapeno, and added black beans, tomatoes, and avocados. Served with your knock off of Chipotle's Cilanto Lime Rice and the Brown Rice Horchata…it was to die for! I've been lurking on your blog for over a year now. Thank you for getting my kids to eat healthy food Gina! You're a gem. Sounds like a fiesta, so glad you enjoyed it! Just a note to say that I had planned to make this over the weekend, but fell a little short on time (you'd think a 2 hour Crockpot recipe would be manageable but I always defy odds). Since I had about an hour, I made the chicken on the stovetop. I seasoned the chicken as the recipe calls for. Warmed the pan on low with a bit of olive oil and then I covered the chicken in the salsa verde. I covered the pan and turned them occasionally, always spooning the salsa back onto the chicken to keep it moist and flavored. Once they'd cooked thru I reduced the heat even more and shredded the chicken so that it had a little time to soak up the salsa. It smelled wonderful and my mister and I both enjoyed the flavor. So, while I'm sure the Crockpot version would have been even more tender and flavorful, the stovetop worked too and caught me back up on time. Thanks for always providing such wonderfully nutritious and delicious meals, Gina! I made these last night! They were incredible! This was FANTASTIC!!! My hubs couldn't get enough. He's already talking about things I can make with the Verde Chicken!! Thank you so much for sharing such delicious recipes!!!! I have never liked cabbage, but I tried it anyways. This was absolutely one of my favorite meals EVER! So delicious. I made the southwest black bean salad as a side dish but put it on top and loved it. Could you clarify your macros a little. It says servings size is 1/2 cup yet you say to only put 1/3 cup on the tostada. Also, does the 1/2 cup serving size just mean 1 tostada? Can you use any salsa or must you use salsa verde? OMG I LOVE these; the colors look fabulous too, Gina. Tostadas are my quickie go-to meal when I can't think of anything else to make for dinner–I just pile up whatever I have in the fridge. But this combo is so inventive; love the idea of the slaw on top. I'll be making this for sure. Thanks for sharing! Good question 😉 I'm sure Gina will answer you but I thought I'd reply. I would think a portion would be one tostado (although my boys might disagree 😉 I would suggest making cumin black beans as a side, that's our fav! Gwen that would be yummy! Amanda, you could have 2, which would be a complete meal (carbs, protein, vegetable) for 10 WW points. Great healthy option for lunch! Love a good easy meal like this! Added bonus is that most of these ingredients are pantry staples for us! I LOVE how easy your recipe is, Gina! These tostadas look totally mouthwatering and delicious. Thanks for sharing! Can you say yum-o! I love tostadas!!! I bet some broccoli slaw would work great! I plan to try with red onions marinated in the lime juice mixture. I recently tried the same red onion slaw in a weight watcher recipe and it was delicious. Pickled red onions would be awesom! we used lettuce. you put the slaw on after they bake. it's fresher. Black bean and mango salsa goes really well on top of this!